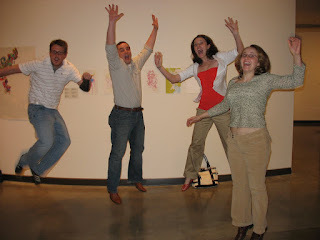 Jumps for Joy: Jumping at the NINE Opening! 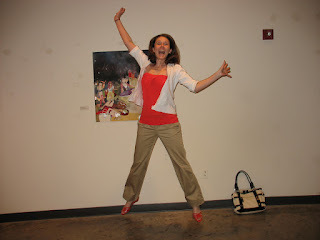 Jumping at the NINE Opening! Thanks to everyone who made it out to AU's first year MFA opening on Friday. We had a great turn out. We also had a ton of Art Jumping! 1. Lana Stephens and Tom jumping for Lana's chalk drawings. 2. Me jumping for my collage. 3. Kate Gartrell and Amy Misurelli jumping for Kate's painting of Amy. 4. 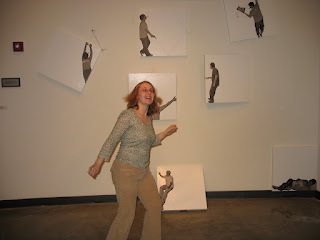 Alyssa Thompson jumping for Igor Pasternak's paintings/collages. 6. Aubrey Driggers, Billy Walter, Leah Painter, and Alyssa Thompson jumped for Nikki Painter's drawings. 7. 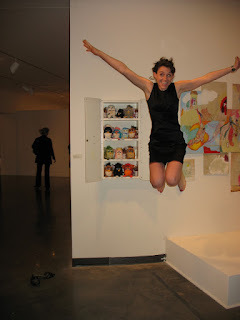 Nikki Painter jumping for Bonner Sale's installation. 8. 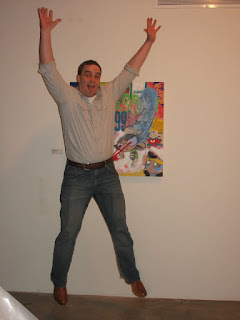 Billy Walter jumping for a painting by Josh Baptista. For a great wrap-up on the show (via Rachel Fick), visit ArtCade Forum. For more pictures, head on over to there were ten tigers.